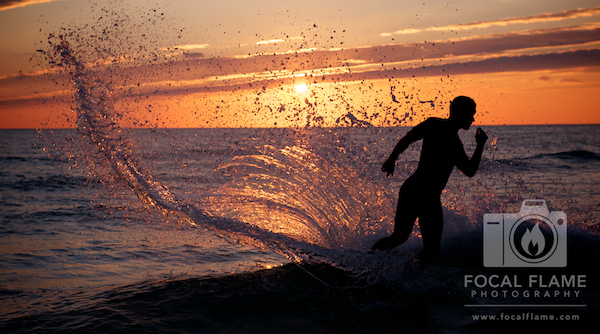 On the eve of IronMan Florida in Panama City Beach, photographer Clint Thayer took an oceanside walk. While a boy played in sunlit water, Thayer re-discovered photography memories from his youth. Here, he shares his thoughts. I grew up in northern Ohio on the shores of Lake Erie. The first subject matter I studied with my trusted Pentax ME Super film camera were 15- to 20-foot storm waves breaking over the ~600 foot long dock in my hometown of Lakeside. For a teenager living in a small town these sessions bridged both my early love of photography, and my more rebellious side. Getting the images I dreamed of involved some small amount of risk, and more importantly, a rhythm. I would stand halfway out on the dock (closed due to the storms) - wait for the waves to hit a specific corner - watch them - crouch down and SNAP! I wasted a great deal of film, and got really wet. I had almost forgotten these first days with my beloved Pentax until tonight. I was walking along the beach in Panama City on the eve of shooting another IronMan race. As I waited for the sun to dip low enough to paint the sky an amazing spectrum of pinks and reds, I noticed a kid having a little fun in the water. Instantly, I was back on the Lakeside dock. Watch the waves - wait for the right one - there it is - crouch and SNAP! There were no storms, no 20-foot swells, but capturing that simple moment in time reaffirmed my desire to pick up a camera. In a few days I'll be strapping on photo gear. My field bag is filled with maps, supplies, and my trusted notebook with logistical information needed to capture that moment in time when a human does something truly amazing. And I'll be looking for the rhythm, the motion, and those split-seconds that tell a story. 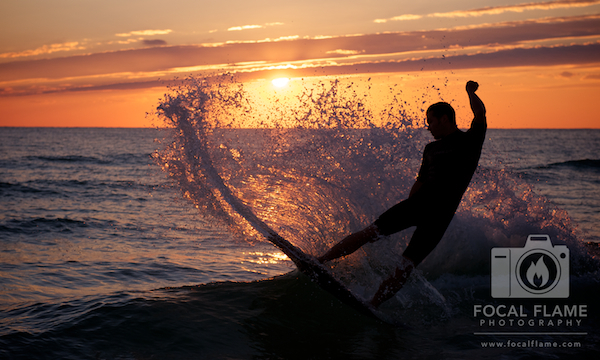 To follow these and other stories, join the Focal Flame Photography Facebook page and follow us on Twitter!